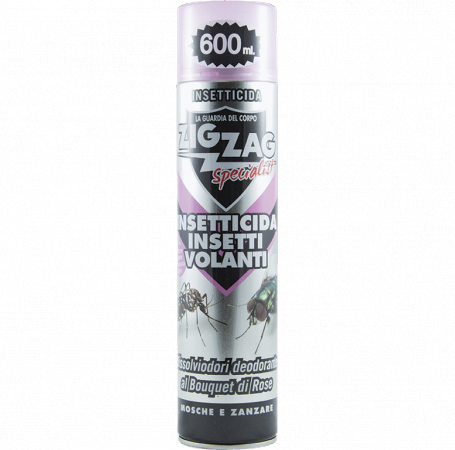 Insecticide Spray with "dry formula" combining the heavily abrasive properties of insecticide active ingredients, with a great fragrance to Lavender. For flying insects: mosquito, mosquito tiger, flies, wasp, horseflies, moths, sandfly, bed bugs. To stay longer in suspension in the air thus increasing the effectiveness of the usual flying insecticides. It also does not fall to the ground, does not wet and does not stain. Respect the Environment: It does not contain gases and propellants deemed to be harmful to the ozone. This product is also available in Lavanda and Pine. Spray the product for a few seconds (4/6) in the environment to be treated, as high aspossible and with a circular motion. In the air environment to be treated. Foods and food containers. Of flame or any incandescent material. Do not use againstcrawling insects and in areas close to the floor. Thanks to the "dry formula", it remains long in suspension, prolonging its effectiveness, does not fall, does not stain and acts by contact and ingestion, it kills in few minutes the insects.